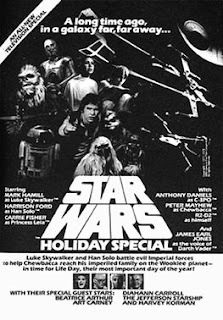 Our faithful chronicler, Doctor Caligari, records that on this day among many, may other momentous events in 1978, CBS aired the two-hour, never to be rebroadcast spectacle, the Star Wars Holiday Special (lest you thought Christmas-creep was a new thing) on this evening. The nearly unwatchable show (made harder to view by dint of the fact that only bootleg copies of poor fidelity are in circulation) hinges on the plot of Han Solo and Chewbacca travelling to Kashyyk, the Wookie home world, to celebrate Life Day with his family (Itchy, like Chewie, being a nickname and short for Attichitcuk). The special introduces the bounty-hunter Boba Fett as well as Ackmena, a Mos Eisley’s cantina bartender played by Bea Arthur and for the first time credits the voice of Darth Vader to James Earl Jones. The original cast gather at the end to spend the holiday together.